The Lutheran Campus Ministry and Cru, the Christian group at Marquette, arranged a trip to Israel over winter break. When Ryan Ristow, a sophomore in the College of Business Administration, told his parents he wanted to go to Israel over winter break, they told him it was a bad idea. But after attending the informational meeting for the Dec. 30-Jan. 9 Campus Ministry trip and finding out how cheap the trip was, he knew he had to go—even if he had to pay out of pocket. The trip was presented by Lutheran Campus Ministry and Cru, a Christian group at Marquette. During the trip, students toured historical and biblical sites such as the Western Wall and the Sea of Galilee. Rev. Jessica Short, a Lutheran pastor and faculty adviser on the trip, said she believed the experience was valuable for students. 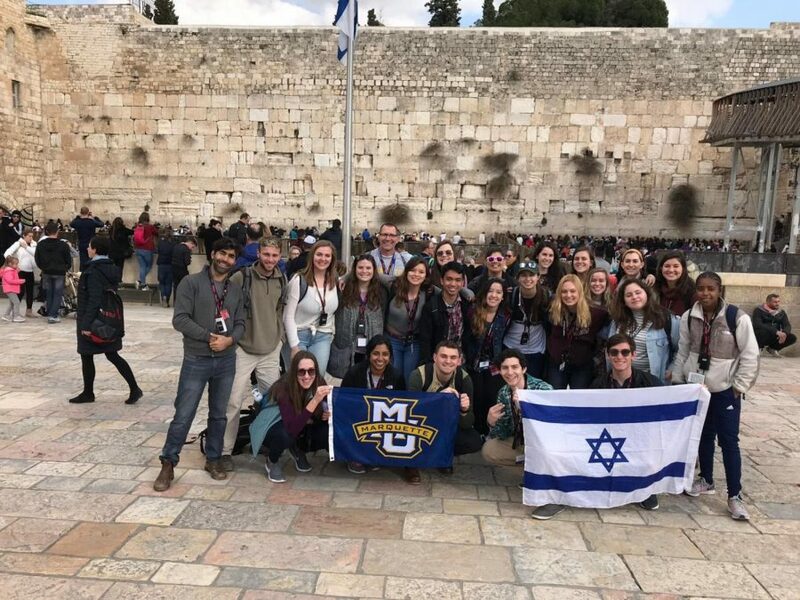 “The purpose of the trip was for Christian students to experience Israel and to visit the holy sites that (are) sacred places for Christians and Jews,” Short said. “There was also an element of learning about geopolitical issues, but this element was through the lens of Israel and specifically the Jewish state of Israel. Short said another reason for the trip was to build a relationship with the Jewish Student Union and understand the complex political and religious issues currently in Israel. The students had the opportunity to travel to sites where events described in the Bible took place. “It made the Bible feel more real, which really strengthened my faith and changed the way I read the Bible,” Madeline Arzbecker, a junior in the College of Health Sciences who went on the trip, said. The students had tour guides who told them the details and significance of each place they visited and allowed them time to reflect on their faith. Marquette students also learned about the conflicts occurring in this part of the world such as the tension between Israel and Palestine. Diebold said she never felt unsafe during the trip, despite the fact many of her friends thought it may be dangerous. Short said that while people hear a lot about the violence in the Middle East, it is important to see the situation firsthand before passing judgement. Arzbecker said the students gained an appreciation not only for their own faiths, but for other faiths as well. Short said learning about others in this way was one of the most important parts of the trip. Short said that students only paid $600 for the trip, and the rest was subsidized by the Christian education organization Passages and the Museum of the Bible. Chloe David, a junior in the College of Engineering, said the trip was similar to a Jewish birthright trip. A birthright trip is a 10 day trip to Israel for Jewish young adults to learn more about their faith and is sponsored by the nonprofit Taglit-Birthright Israel organization, according to Birthright Israel.